Way to go CCHS Cheer! 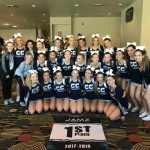 Good first outing for Corner Canyon Cheer today! Two 1st Place banners and a Grand Champion award for Silver! Go Chargers!